Take a coffee break at selected PETRONAS station for a smoother balik kampung journey! While on the way balik kampung, do drop by at any of the 33 selected PETRONAS station to enjoy a variety of drinks and snack, all for FREE courtesy of PETRONAS. 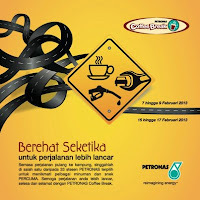 PETRONAS wishes you a smooth, comfortable and safe journey with PETRONAS Coffee Break.